The newest update to our award winning data visualization tool provides even more content for you to explore! 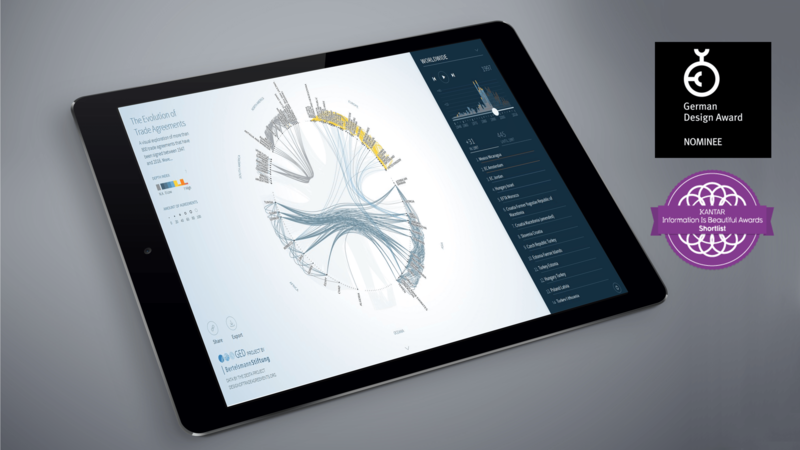 It has been two years since we first launched our award winning data visualization tool FTA VIS. Since then our platform has helped tell thousands of data stories to explain the formation and history of free trade agreements to people all around the world. Today we are launching our new and updated version of FTA VIS. Dive on in as more deals, more information and more stories are waiting to be explored! For the past twenty and more years, Free Trade Agreements (FTAs) have spread across the global economy like wildfire. It is estimated that, since 1995, more than 400 regional trade agreements have been registered, up from a mere 124 for the 1948 – 1994. Uncertain and often controversial negotiations about immense deals such as NAFTA, the TPP or TTIP create more public interest in FTAs than at any previous time in history. Using data from the DESTA database , FTA VIS helps us to visualize such deals in easy to understand pictures that do not simply look amazing but provide you with a range of background information on each deal, too. With FTA VIS one picture truly is worth a thousand words. What can I learn through FTA VIS? Since we made this video two years ago, a lot has happened. In this newest update for FTA VIS we have added even more content for you to explore. Our Visualization now includes all registered agreements up to the year 2016 and 89 more agreements that are currently still in the negotiation phase. But that’s not all. You can now also learn even more information about every single agreement in our data base. Simply click on any of the agreements displayed on the right hand side list of FTA VIS and the visualization will take you straight to an extended info page for the agreement detailing exactly who is part of this deal and what precisely is included in this deal and what isn’t. On top of that our new and improved design is even more intuitive and provides you with beautiful visualizations each one of which you can always export in downloadable picture format with just one simple click. So what are you waiting for? Simply click here or on the link at the top of this blog post and start exploring with FTA VIS! The data for FTA VIS is freely available at designoftradeagreements.org and was collected by an international team of researchers. It was originally published in: Dür, A., Baccini L., and Elsig M. 2014. The Design of International Trade Agreements: Introducing a New Dataset. The Review of International Organizations.